Sun Business Solutions excels at training employees to compete within the organisation; it enables them to better themselves as professionals. As does mature organization know: “it is only good as its people”. Our employees are our priority. The accolades of Sun Business Solutions stems from a brilliant dedicated young workforce. Sun Business Solutions excels at training employees to compete within the organization; it enables them to better themselves as professionals. As does mature organization know: “it is only as good as its people”. Our employees are our priority. The accolades of Sun Business Solutions stems from a brilliant dedicated young workforce. At SBS we maintain a steady protocol in absorbing talents from multiple catchment venues and geographical locations. Our inclination is to get the best and potential talents that suite out(our) profile. Not only that, our hiring process keeps potential talents connected with us in warmth. Our pre-recruitment HR team ensures background verification of shortlisted talents, as well. Training at Sun Business solutions establishes special focus on the ideals of functional & core competency. Our Training helps develop reflective thinking in the minds of our employees enabling self introspection of their character flaws and groom them into making a talented employee. 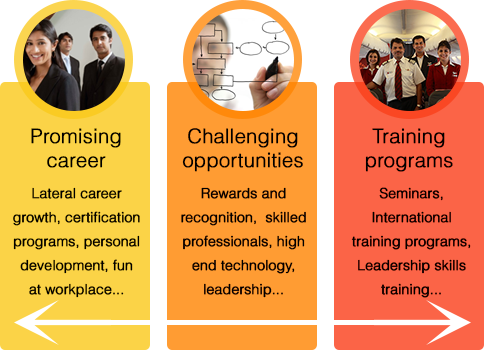 At SBS we impart both Conventional & Modern approach of Training & Development. The Conventional training covers essential work-related skills, techniques and knowledge. Our Modern approach inculcates creative methodology which directly reflects on employee retention and yields better results. Our Training Module includes: Lectures, Demonstration, Group Discussions, Computer based training, Behavioural training, Games & Simulations, besides imparting On the Job Training.